Trust me. I was skeptical too. When my then boyfriend, now husband tried to explain the beauty of a South African Braai, I’ll be honest, I didn’t really get it. It sounded like a basic barbecue. A gathering of friends and family eating food from the grill. “Our barbecues are great,” I argued. “My dad makes a mean burger.” But whenever we cooked out on the grill, my husband’s face said it all – he longed for his beloved braai. Just a little bit of background for those who have never heard of a braai. The word braai comes from the word braaivleis, which is Afrikaans for roasted meat. Braai means “barbecue” and vleis means “meat.” The word is pronounced “bry” and although it originated with the Afrikaans, the word and social custom has been adopted by many ethnic cultures within Southern Africa. 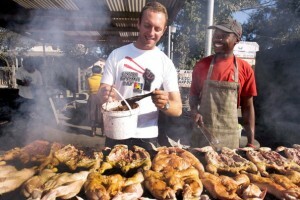 When I first visited South Africa in 2010, the night I arrived I was treated to the first of what would be many braais. I can honestly say I will never see a barbecue the same again. The food, the drinks, it was so much similar, so simple, but somehow so much better than our typical American cook-out. 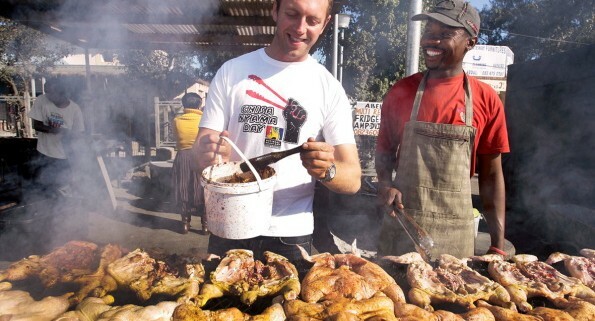 I’ll try to explain in ways my husband couldn’t, the top five reasons a South African braai takes the gold over an American barbecue. That’s right. Birthday braai, christmas braai, going away braai, welcome home braai, a wednesday night just to get a few friends together braai, a graduation braai, housewarming braai, these are all perfectly acceptable times to have a braai. A braai, unlike a barbecue, is not only reserved for a Summer Day, Memorial Day or Labor Day, it’s an any and every day celebration of life. While American’s bring out the sandwich platters, fingers snacks, and hot dogs, South African’s light up the braai.